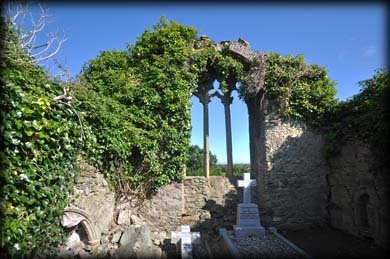 The 13th century parish church of Tomhaggard is, like the nearby holy well, dedicated to St Anne. It is a simple undivided nave and chancel church, with a double bellcote at the apex of the west gable. The west wall has an ogee headed window with a splayed embrasure. In the east wall there is a very nice three-light window with ogee-headed tracery set in an embrasure. At the east end of the north internal wall is a decorated narrow tomb-niche. Facing the tomb-niche in the south wall is a pointed aumbry. Tomhaggard Parish is situated in the Barony of Bargy. The name is believed to derive from Tuaim Mosacra – the tomb of St. Moshagra of Saggart or less likely Tuaim an tSagairt – the priest’s mound. At one time the church was assigned to Tintern Abbey before passing to Geoffrey St John, later Bishop of Ferns, in 1255. It is one of the many churches destroyed by Cromwells troops in 1649. 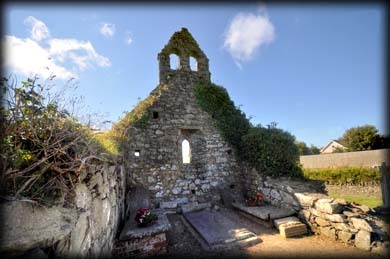 Situated: Take the turn facing St Anne's Church in the centre of Tomhaggard village. The old medieval church is on your left opposite St Anne's Well. Discovery Map 77: T 0297 0815. Last visit Aug 2015.